Online Travel Agents (OTAs) are an ineluctable supplement in promoting your hotel business, though often times because of negligence in your hotel distribution strategy, you may face low occupancy or your hotel rooms remain vacant and you face a major revenue loss. But naturally, this may be happening on a daily basis at several hotels worldwide, turning this into a regular yet highly damaging scenario. If you’re one of them, this blog will work as a life-saver for you; letting you relate with the mistakes you’re typically making in your hotel distribution strategy and giving you a solution for them. So, do you plan to stop revenue loss in your hotel business? Then you’re reading an apt analysis of mistakes done in distribution channel strategies. When you devise your hotel’s online distribution strategy, it is mandatory to keep records and statistics handy that give you a complete picture of your business status, as to where you need to focus on and which mistakes to avoid in order to eliminate the impending losses. Employing a right channel manager is not enough. Instead, you ought to be flexible in distribution strategy too. Taking a helicopter view, I spoke to dozens of hoteliers like you worldwide, where I got to learn about the 7 major mistakes they make while executing a hotel distribution strategy, which took a toll on their business. Mostly, all hoteliers have many OTA connections for their hotel to be open to receive bookings from as many channels as they can. Over and above that, the inventory and rate on these channels are handled manually, which poses as an extremely redundant and time-consuming method. Apparently, these kind of hoteliers are skeptical about adopting a new technology. How’s it a mistake you ask? Well, to cut it short, let’s say a booking comes from OTA 1. Now because of no central control and manual inventory management, you’ll need to login to each OTA’s extranet one by one and update the inventory. Definitely, this update will not be instant or error-free, and there are high chances of you getting overbooked for the same room on some other OTA. Solution: Running with time and getting empowered with technology is the demand of the hour. Employ a hotel channel manager that will automate all your inventory distribution operations. You’ll get a one-stop control over all your connected channels, with instant inventory updates which will nullify your overbookings and of course, reduce your efforts invested in manually updating the inventory everytime a booking comes. 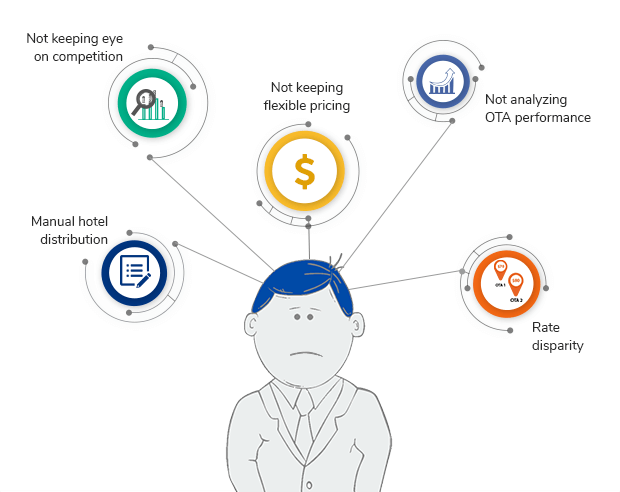 Often times hotel room rates distributed on OTAs are different – a miscalculation done by many when working on their hotel distribution strategy. (I’m sure you must’ve at least considered doing this, if not actually doing it. ) I know each OTA charges different commission for the bookings, and it is one of the major reasons you decide to keep separate pricing on each one. But you see, few leading OTAs have devised the rate parity rule, which goes against your plan to keep distinct rates on each OTA. Solution: To avoid the anger of OTAs you must prefer rate parity over distinct tariff. Even you can communicate and negotiate on commission rates for maintaining the same rate when certain OTAs charge higher than others. Maintaining rate parity gives a standard rate on all OTAs sending a positive image to your potential guests too. Have you pushed inventory for a limited time? For 3 months or so… if yes, few hoteliers commit the same mistake. This can cause a loss of future booking opportunities. For instance, if a guest searches the hotel room for an advanced date, availability of the room isn’t there and you incur a revenue loss of future or advance bookings. Definitely, this is a proved mistake in a hotel distribution strategy. Solution: For avoiding a loss of revenue, you need to plan distribution strategy for the next 365 days. It is estimated that any guest would like to book with you in advance because traveling to most destinations is planned well in advance. Well, you’re connected with multiple OTAs, right? Now each OTA may be bringing you a varied number of bookings or may have a different procedure to register. So what happens is, each channel will have a different room type listed; leading to loss of your bookings for absent room types. Let’s say, you’ve got an Executive Suite and you’re listing it on Channel A under the same name and as Deluxe Suite on Channel B. Obviously, you’ll lose your Executive Suite bookings on Channel B. Solution: Simply start selling same room types on all your connected channels OR AT LEAST keep an eye on the room types you map on the channels. You never know which channel can get you how many bookings for any room type you have. And you definitely don’t want to lose any more bookings. See, the hotel industry is a dynamic one. One time you may have a high influx of guests and other time, you may get no guests for days at a time. This is what happens when you don’t set flexible pricing based on the occupancy at your hotel, depending on the seasons you face or even on the types of guests you get. And because of this grave mistake in your hotel distribution strategy, you’ll lose bookings at a high rate. Solution: A channel manager with a yield management module can automatically change rates as per the occupancy you get, and even on the seasons, you set. For instance, if less than 40% rooms are booked, then your prices are lowered to attract more bookings. And, if the occupancy level is more than 80%, your rates will be inflated so that you get more revenue. In short, yield management works on the supply and demand ratio on the basis of which your inventory management system lets you derive the Best Available Retail Rate (BAR) for selling the correct room at the right price. Missing your eye on the competition is again a common flaw. Travelers always compare prices before they book. And pricing without knowing the competitor’s tariff may not attract your potential guests. So, if you do not use any competitor monitoring tool in your hotel distribution strategy, then you are deprived of competitive pricing and thereby of higher bookings. Solution: Employing a competition monitoring tool aids you in managing a competitive tariff based on market rate. You get access to doubtless insights on competitor tariff and rate forecasts for your hotel rooms all the year-round, giving you the opportunity to earn the highest profit from your hotel business. Not taking decisions based on reports or not analyzing the OTA performance, is one of the biggest flaw done on the part of the hoteliers. Decisions based on gut feelings may go wrong many times, so you need to avoid such instances. Solution: Reports in channel manager’s extranet plays a huge role in defining or shaping up your business decisions on selecting OTAs. They are data-based, giving you accurate statistics reports on bookings coming from various channels. Average revenue for a period i.e. monthly and yearly reports give you insights on deriving on taking business developing decisions. Even you can decide on which promotions, rate types, room types, work best for your hotel. With above-mentioned mistakes that you or your fellow hoteliers might be making, we’re sure that now you’ll be able to apply these strategies while devising a distribution strategy. A hotel channel manager here, can work as the apt solution to avoid these mistakes and master the art of inventory distribution. As you explore the reasons to invest in a channel manager, do give it a thought and determine what mistakes you’re making for your hotel business.